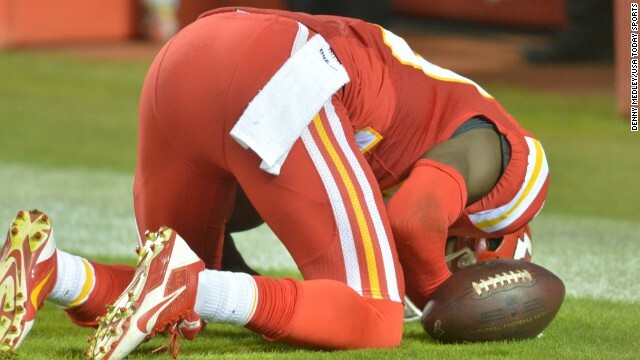 (CNN) - Husain Abdullah can kneel and pray pretty much anywhere in America he wants. Except, perhaps, for an NFL end zone. The rules prohibit players from celebrating while on the ground, but officials should not "flag a player who goes to the ground as part of a religious celebration," Signora added. As many observers have noted, Christian players often celebrate by kneeling in prayer after making big plays. The Council on American-Islamic Relations, a Muslim civil rights group, called on the NFL to make its rules about on-field celebrations more clear. “To prevent the appearance of a double standard, we urge league officials to clarify the policy on prayer and recognize that the official made a mistake in this case,” said CAIR spokesman Ibrahim Hooper. (CNN) - The country collectively winced as we watched an NFL running back punch his fiancee in the face on an elevator, captured by security video. The horror in the country crossed all the usual ideological and political divisions. Consciences intuitively knew this was wrong and shocking. The video brought to light for many Americans what every church and religious institution in America must deal with on an ongoing basis: violence against women. As a Christian, I believe it’s important to see this issue through the dual lenses of both the responsibility of the state and of the church. The state, and the larger culture, has a responsibility to work against such violence. The Scripture says that the state is delegated a “sword” of justice to be used against “evildoers” (Roman 13:4). That clearly applies in these horrifying cases. There is no question that a man who would abuse a woman is socially and psychologically twisted, but we should not allow this to in any way ameliorate the moral and public evil involved in these cases. Pope Francis looks pretty confident, don't ya think? (CNN)– Will the World Cup final become a "Holy War"? At the very least, Sunday's match could put millions of Catholics - not to mention Vatican employees - in a bit of a bind. Will they root for Argentina, the homeland of Pope Francis, who is known to be an ardent soccer aficionado? 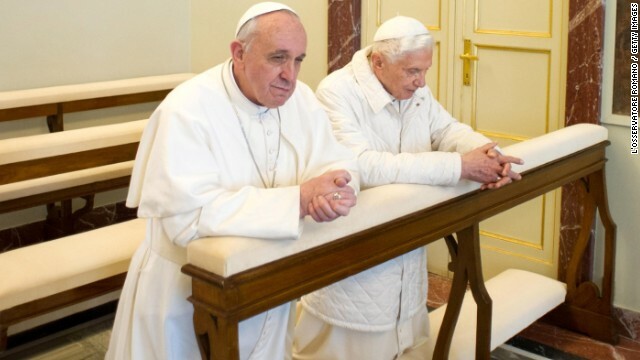 Or will they back Germany, the native country of Pope Emeritus Benedict XVI, also a football fan? And what about the Big Referee Upstairs? Whose prayers will he heed when the game is on the line? Germany reached the final match on Tuesday by blowing out Brazil, the host country. Argentina beat the Netherlands on Wednesday afternoon. Of course, both Popes (not to mention God) have more important things on their minds. But the pontiffs have also said that sports can be more than fun and games. Tim Howard's saving power has the Twitter masses crying for more. (CNN) - Yeah, but can he walk on water? After Team USA goalie Tim Howard's divine performance in Tuesday's World Cup match against Belgium, some folks - ok, a lot of folks - were comparing the devout Christian's saving power to Jesus. Here are some top tweets about the Man in Goal and the Man from Galilee. If you see any good ones, please send them to me @BurkeCNN. (CNN)– As I sat backstage, I could hear the sound of thousands cheering as they waited for me to enter the ring. “Lord put your covering over me,” I prayed in a whisper. “Use me as a witness. Use me to be a billboard for you." I’m a pastor by trade, and the next morning I was set to preach the Easter sermon. But on that night, I was preparing for something else entirely. This wasn’t the normal, churchgoing crowd. I was about to enter the cage and compete in a mixed martial arts bout. When I tell people I’m a pastor and a mixed martial arts fighter, I usually get some puzzled looks. (CNN) - Before he watches his beloved Denver Broncos in the Super Bowl this Sunday, Kyle Herman has some important rituals to perform. Just as he has for years, in the morning he will pick out the Broncos jersey to wear for the game. He will slip on his high-school ring, refashioned in Broncos blue and orange, and surround his television with team paraphernalia, from signed footballs to a pillow. Herman has several Broncos jerseys, and if a certain player is stinking up the field, the 21-year-old from Beaver Falls, Wisconsin, will put on that player's jersey. You know, to give them a little more mojo. Herman may think his rituals are silly, but he’s far from alone in his sports superstitions. According to a poll released in January by the Public Religion Research Institute, about half of all Americans believe that some element of the supernatural plays a role in sporting events. 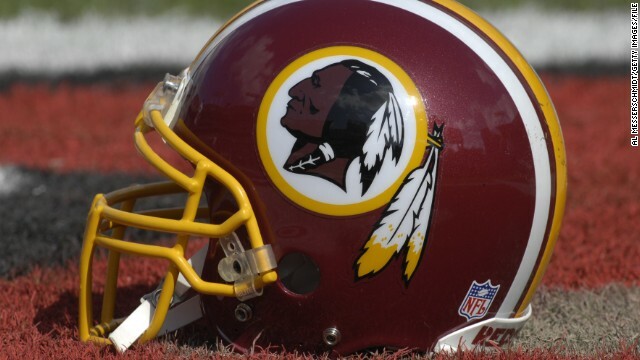 Some religious leaders say that the Washington Redskins should drop their nickname. 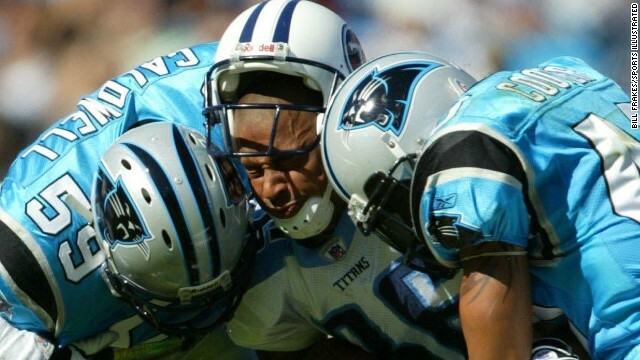 (CNN) - Should religious leaders care about a football team’s name? We believe the answer is yes. Religious leaders have a mandate to inspire their communities to come closer to God. Sometimes this requires speaking out about even something as secular as a football team’s name. We are so concerned about the name of Washington's National Football League team that we are encouraging our synagogues and our schools to become Redskins-free zones. Synagogues and religious schools are places where we strive toward a broader awareness of the godly nature of all humanity. That's why the Redskins name has no place in our halls and walls. The name represents a derogatory term and recalls a brutal history of genocide and torture - a past of racist dehumanization inflicted upon the American Indians of the United States. Allen Craig of the St. Louis Cardinals gets tripped up by Will Middlebrooks of the Boston Red Sox during the 2013 World Series. (CNN) - This is a post about the instantly infamous “obstruction” call that ended Game 3 of the World Series between the Boston Red Sox and the St. Louis Cardinals on Saturday. But it starts with an epiphany I had years ago about Vatican law. This epiphany came in the form of a 2005 op-ed on gay Catholic priests, written by John Allen of the National Catholic Reporter. As a long-time observer of all things Vatican, Allen was trying to explain to American readers why there will always be gay priests. In so doing, he drew a sharp distinction between Italian law (which holds sway in the Vatican) and Anglo-Saxon law (which prevails in the United States).